How important it is to wear blush? If you ask me, the importance of blush was most of the time disregarded by me, simply because I didn't understand exactly where and how to apply. But my love for blushes grew just last year when Anamika sent over a box of 8 gorgeous blushes. It gave me ample of opportunities to experiment and fall in love with this beauty product. 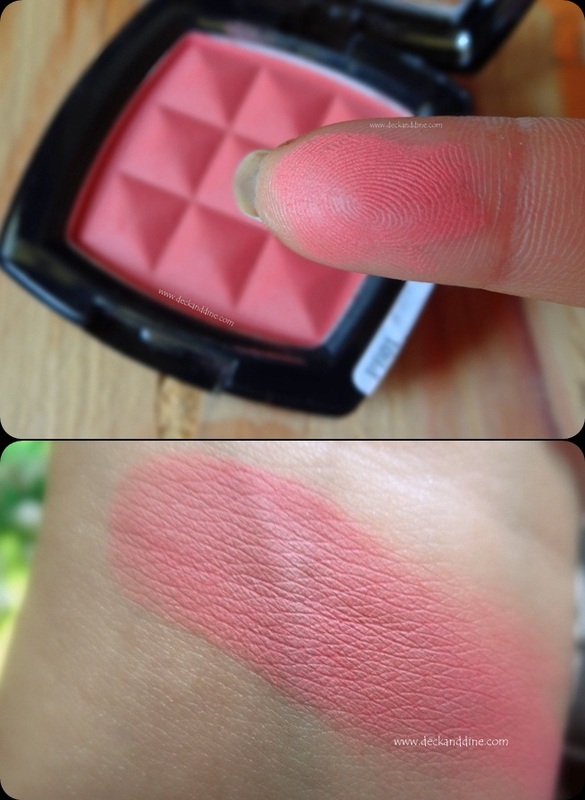 So once on my trip to Sephora few months, I was randomly swatching the NYX blushes and fell for this shade instantly. Yes, I didn't think twice before buying it. Our pressed powder blush delivers sheer silky color that glides on easily blends beautifully and creates a natural glow. The formula is richly-pigmented and lasts for hours. Available in 24 radiant colors! The blush comes safely enclosed in a square shaped case with rounded corners. Lightweight and compact. The transparent lid makes it easy to detect the actual shade inside. Love the diamond pattern on the blush. NYX describes Mocha as Matte Mid-tone Pink and I can’t aree more. It is a great everyday wear shade and very versatile. You can either apply just a little for natural looking flushed cheeks, or you can also add a nice visible coat which would definitely rock any evening look. It has a soft powdery texture and applies smoothly on cheeks. It is non chalky and gives a really natural, beautiful and feminine flushed look. It lasts for hours on me and I always get compliments when I wear it. Versatile, can be used both during day and at night. It is very easy to go overboard with NYX blushes. So you have to be really careful about the amount you are taking on your brush. A beautiful dusty pink with warm undertones, I guess it will look beautiful on almost everyone, especially on most of us Indians. Yayyy…!! It has a wonderful texture, color payoff and staying power. I would definitely recommend this blush to you all. It is totally worth every penny. It is a hit and you shouldn't miss. I am already planning to lay my hand on the other shades.